Justice is a moral value whose expression in the Western Tradition (a.k.a., the Judeo-Christian tradition) is to render judgments. Its most common expression is in legal contexts in which justice is served by resolving disputes (criminal or civil) before disinterested parties 1)In Western Law this might be a court or magistrate. On this page you will find a brief summary of the Biblical basis for Western justice followed by a critique of Social Justice, a euphemism for a particularly egregious kind of injustice meant to obscure and uplift its effects. …then you shall give life for life, eye for eye, tooth for tooth, hand for hand, foot for foot, burn for burn, wound for wound, stripe for stripe. This was understood by the ancient Hebrews as a figurative expression of “just deserts”, i.e., the judgment must fit the offense. You shall not follow a majority in wrongdoing; when you bear witness in a lawsuit, you shall not side with the majority so as to pervert justice; nor shall you be partial to the poor in a lawsuit. 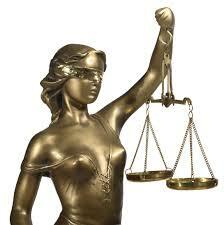 …you shall not be partial to the poor or defer to the great: with justice you shall judge your neighbor. A single witness shall not suffice to convict a person of any crime or wrongdoing in connection with any offense that may be committed. Only on the evidence of two or three witnesses shall a charge be sustained. That the punishment must fit the crime and the injury suffered by the victim must be repaired to the extent possible. That punishment and reparations must be rendered independent of the offender’s station in life. That judgments are rendered by a disinterested party with recognized authority to do so. The benefit of the doubt is given to the accused (i.e., innocent until proven guilty).